One of my favorites from Facebook, always good for a laugh. If your kitchen has no “visible” signs of food… you might have a Weimaraner. If your dog wakes you up in the middle of the night to play… you might have a Weimaraner. If spotting a rabbit while walking your dog puts the fear of God in you… you might have a Weimaraner. If your romantic picnic turns into the sport of food guarding… you might have a Weimaraner. If you say “nook-nook” more than once a day… you might have a Weimaraner. If you can’t even SPELL the words: walk, car, dinner, or ball without your dog going crazy… you might have a Weimaraner. 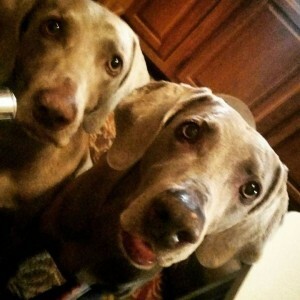 If your floors have water on them within ten feet of your dogs bowl… you might have a Weimaraner. If your dog thinks loading the dishwasher is fun… you might have a Weimaraner. If you have to remove loaves of bread and cereal boxes out of your oven before you can use it… you might have a Weimaraner. If your dog thinks chewing a bone is a “team sport” in which you hold the bone while they chew… you might have a Weimaraner. If you have made more than one trip to the “emergency” vet and received the diagnosis “intestinal foreign object”… you might have a Weimaraner. 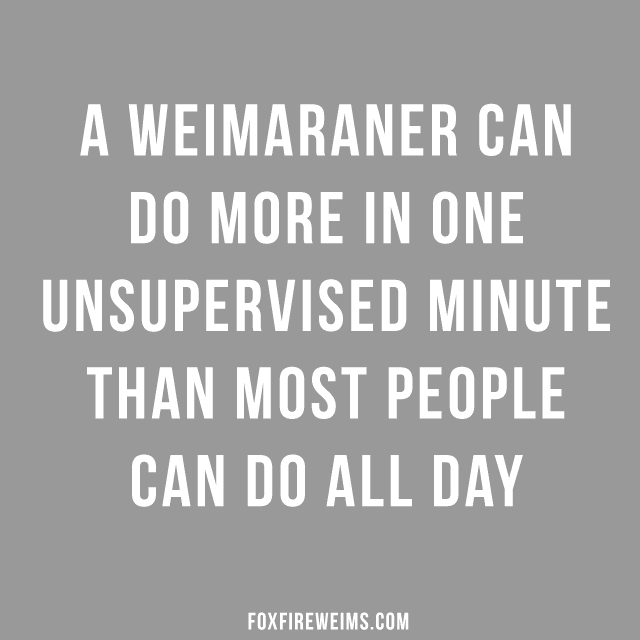 If when you hear the word “surfing” you think first of your kitchen and not water… you might have a Weimaraner. If your dog insists on sleeping next to you “UNDER” the covers… you might have a Weimaraner. If you have to hide your kitchen sponge in your dishwasher… you might have a Weimaraner. If you have used both the words “graceful” and “goofy” in the same sentence… you might have a Weimaraner. If you have taken a bite out of YOUR sandwich at the same time you dog takes a bite out of the SAME sandwich… you might have a Weimaraner. If your home has more toys than furniture… you might have a Weimaraner. If your dog thinks it doesn’t need to answer to its name just because you can’t see it… you might have a Weimaraner. If you know what garbageitis means… you might have a Weimaraner. If you have had more than one conversation with your vet regarding separation anxiety… you might have a Weimaraner. If you love your dog more than most humans… you might have a Weimaraner.